Quality is integral to RUD Australia. Our chain technology and lifting solutions are widely regarded as the very best available worldwide. The reliability and safety of our products is our hallmark. We’re proud to hold a reputation for excellence and determined to earn this reputation in everything we do. From our innovative tailored solutions to our niche off-the-shelf products, we set clear quality standards and follow detailed management systems to ensure they’re achieved. Our technical products and solutions are the result of rigorous process. Underpinning this process is our people. Our team is comprehensively trained, beginning at induction and continuing as ongoing professional development. Our management systems are documented and applied to ensure that every product is manufactured, tested and assessed against our strict standards. We also regularly audit our processes and products, ensuring our work continues to deliver on our quality commitment. This commitment forms part of our policy for quality, environment, health and safety. RUD Australia is accredited with the National Association of Testing Authorities (NATA) for mechanical testing in accordance with ISO/IEC 17025. 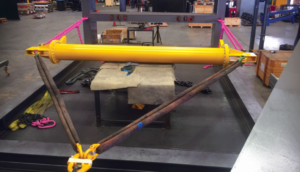 We’re recognised as fully compliant with standards for testing lifting gear, and tensioning and staying systems for proof loading. RUD Australia has been audited by the global Lifting Equipment Engineers Association (LEEA) and admitted as a full member. This audit confirms that RUD Australia complies with regulations and standards for equipment design, manufacture, service and repair, as well as distribution and hire across Australia. Every day we take small steps to make our business better. This is a RUD value as a team we take very seriously. Today we are proud to say that despite a 33% increase in production since 2016 at our Brisbane Head office, there has been near to no increases in waste, energy and water. We are also proud to have been awarded the title of CCIQ ecoBiz 3 star partner and are committed to become even more environmentally friendly.